J.J. Abrams’ first Star Trek film faced a daunting challenge. It had to accomplish three not-necessarily-complementary goals in just over two hours. First, it had to introduce a new generation of fans to no less than seven main characters (Kirk, Spock, Bones, Uhura, Sulu, Chekov, and Scotty). Second, it had to perform that introduction in a way that would placate long time fans of the show and keep them from getting jittery about their favorite obsession. And third, it had to do what any action flick has to do: tell an interesting, original story that keeps the plot moving. Abrams nailed it. Star Trek (2009) was clever and funny and action-packed, a perfect reboot that deftly used time travel to deflect the concerns of old fans while creating a new generation of Trekkies ready to boldly go where no man has gone before. Needless to say, expectations were high for the sequel. Perhaps too high. Star Trek Into Darkness is a high octane but messily plotted romp that relies on excellent performances to paper over plot holes you could pilot a galaxy-class starship through. The film begins with the crew of the Enterprise on a far-off planet, attempting to save a technologically backwards tribe from destruction by a volcano. As Captain Kirk (Chris Pine) and Dr. Leonard "Bones" McCoy (Karl Urban) draw the natives away from a temple in the kill-zone, Commander Spock (Zachary Quinto) prepares a lava-freezing bomb (oddly referred to as a "cold fusion" device—one wonders if writers Roberto Orci, Alex Kurtzman, and Damon Lindelof understand what "cold fusion" actually is). The bomb goes off and the savages are saved. But there is a hitch. To save Spock from death-by-"cold-fusion," the Enterprise has to buzz the heads of the pre-warp indigenous types. Spock repeatedly describes this as a violation of the famed Prime Directive, which requires Starfleet officers not to interfere with technologically primitive societies. Maybe you see the problem here, but I’ll spell it out anyway. The crew has already violated the Prime Directive by saving the society from destruction, an act Spock appears to have spearheaded. Glaring logical flaws such as this litter the film, distracting viewers who, as they lurch from scene to scene, may spend more than a few seconds thinking about the plot. Kirk’s cowboy act saves Spock’s life but gets him in trouble with Starfleet. He loses the Enterprise to Admiral Pike (Bruce Greenwood), is demoted to first officer, and must learn to "respect the chair" (that is, the captain’s chair) if he’s going to resume command. Fortunately, the demotion lasts all of 10 minutes, because there’s a mad man on the loose by the name of John Harrison (Benedict Cumberbatch). He’s a Starfleet officer with an ax to grind, blowing up a secret research base and wiping out the high command in an attack that calls to mind the helicopter assault in Godfather Part III. Harrison is holding onto a secret, however, and his big reveal will shake Starfleet to its core. I’m vague here on purpose, as people have requested not to know Harrison’s real game. Cumberbatch’s performance is mesmerizing, and does a good job of distracting viewers from the fact that we actually learn very little of Harrison’s true origins or motivations. He’s also used as an exposition-delivery device. It’s a good thing Cumberbatch is as skilled as he is, because Harrison just talks and talks and talks. 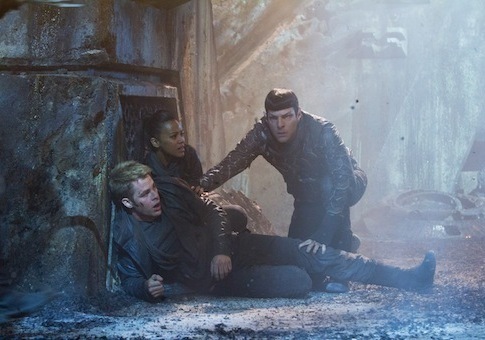 The two Abrams Treks are at their best when the personalities of the crew are able to bounce off each other—Spock’s playing straight man to Kirk’s womanizing joker, Uhura’s (Zoe Saldana) simmering anger at her Vulcan boyfriend when he fails to show emotion. And the movies are at their worst when they try to insert a political message into the proceedings. There’s an ill-advised and entirely unresolved subplot that involves war with the Klingons, worry about blowback from what amounts to a drone strike, and the militarization of Starfleet. The last point is especially odd given that Starfleet is, essentially, a military outfit. It’s the navy, but in space. There’s a reason these ships come with massive weapons arrays. Star Trek Into Darkness is an entertaining enough film if you don’t bother thinking things through and aren’t bothered by dangling subplots. But it’s a step backwards for the franchise that leapt so boldly back into the spotlight four years ago.